SEA2SKY is a luxurious 5 bedroom, 4 full bathroom oceanfront single family home with beautiful, private walk to the beach and private pool w/waterfall spa. This home features an updated kitchen and 4 bathrooms 2 with walk-in showers. Huge master bedroom with double French doors, covered oceanfront deck w/seating, walk-in closet, has refrigerator and shower with Oceanview. 4 generous sized bedrooms with TV’S, and single sized sofa sleepers. Lower level bedroom has private ensuite w/fridge. Enjoy the round ocean side private pool with new saltwater system and waterfall hot tub. Plenty of deck space and outdoor furniture to relax. Just a few steps on your private walking path to the ocean beaches. Nice big outdoor shower to rinse off. Stunning views all around! Entertain your friends and family in the open living area, overlooking your private pool and the blue Atlantic Ocean. 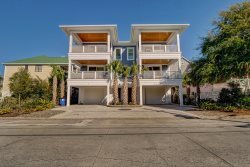 Walk to Kure Beach Pier, Restaurants and activities. The garage offers plenty of parking for two cars and there is additional parking on the street. There are not many single family ocean front homes that offer this gracious space and amenities. Reserve your week now! SEA2SKY will not disappoint! You will be coming back to make memories for many years to come. No need come by our office and wait in line to pick up a key. This home is equipped with a key less entry lock so you can start enjoying your vacation. Essentials such as paper towels and toilet paper will be supplied to get your vacation started! Pool can be heated for an extra $100 a night, weather permitting. Please inquire for details. In order to heat the pool the outside temperature cannot drop below 65 degrees, even overnight. Pets accepted for an additional $200 per dog (maximum of 2 dogs). Please inquire for details. Pool can be heated for an extra $100 a night, weather permitting.